This handcrafted steel bell has bold tones and a contemporary design. We tune our bells to unite two important ways the instrument vibrates. One is the sound of the bell itself and the other is the hollow cavity inside the bell that acts like an organ pipe.The slots on the sides of the bell are the secret to this unique coupling. The result is a rich sound with much depth and beauty. 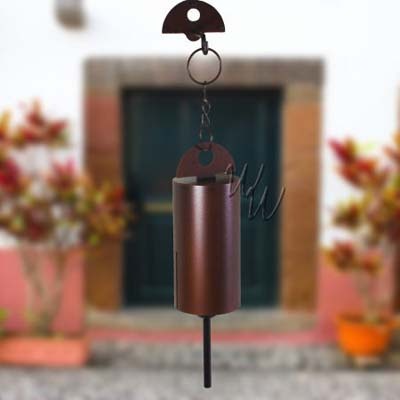 Use this hanging bell to call the family in to supper, or use it as an alternative doorbell. It's beautiful and functional and a great addition to any home. Woodstock has taken the classic bell to a new level. Use this hanging bell to call the family in to supper, or use it as an alternative doorbell. It's beautiful and functional and a great addition to any home. Materials: Antiqued copper powder-coated steel bell and hanging hook.